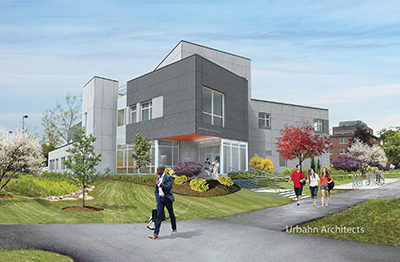 Construction on the new Engineering Innovation Hub is currently underway at the State University of New York (SUNY) New Paltz campus. 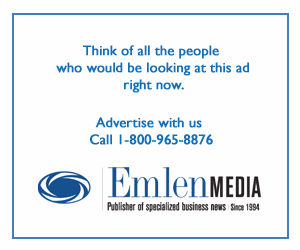 NEW PALTZ, N.Y. — Construction on a new Engineering Innovation Hub is currently underway at the State University of New York (SUNY) New Paltz campus. The new facility will provide state-of-the-art education to SUNY’s engineering students as well as assist the wide variety of regional companies that will be able to use the 3-D printing technology at the new hub. The architect on the project is New York-based Urbahn Architects, with PC Construction out of its Poughkeepsie, N.Y., regional office serving as the general contractor. The 19,500-square-foot Engineering Innovation Hub is expected to be complete by the end of 2018, and has a budget of $14 million. 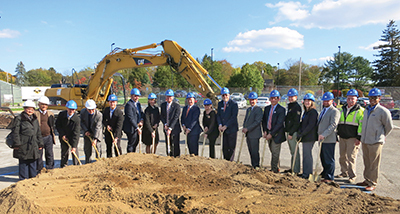 A groundbreaking took place for the project in October 2017 with SUNY President Donald P. Christian leading the ceremony. The architect on the project is Urbahn Architects, with PC Construction serving as the general contractor. The new Engineering Innovation Hub will help support and diversify the college’s engineering programs and address a critical shortage in engineers needed to serve advanced manufacturing interests in the region, according to Christian. In addition, the new hub will house the headquarters and laboratories of the university’s Hudson Valley Advanced Manufacturing Center (HVAMC), provide space for potential business partners under the state’s START-UP NY program and serve as a business incubator for technology and engineering startups in the mid-Hudson Valley. Urbahn designed the new hub to allow for potential expansion if the program’s growth requires more space in the future. 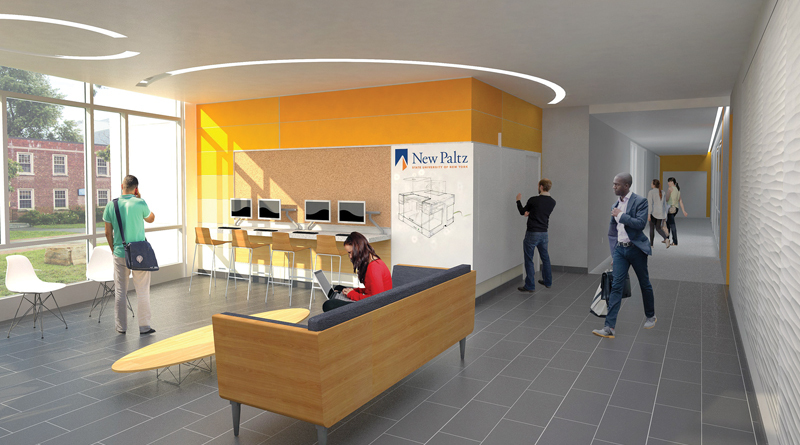 Of particular note, the hub will also provide a 3-D print prototyping lab to support the engineering program and the work of companies partnering with SUNY New Paltz and HVAMC. New York State Governor Andrew Cuomo’s NY SUNY 2020 Challenge Grant program awarded $10 million to the project because of the school’s goals to improve economic development in New York state, using its high-quality educational and research programs. The university also received $1 million through the governor’s Mid-Hudson Regional Economic Development Council’s annual Consolidated Funding Application. The building site of the new hub is a former parking lot located near the existing engineering building, Resnick Hall. The new building is centrally located on campus, requiring strict construction safety and logistics protocols to ensure the welfare of workers, students, faculty and visitors, according to Edward A. Kellogg, regional manager and construction executive at PC Construction. The building is designed to meet LEED Silver standards. Sustainable features will include an on-site stormwater detention system, high-efficiency plumbing fixtures, energy-efficient lighting and HVAC systems, daylight harvesting and the use of recycled content for materials. The design and construction team was represented at the groundbreaking with multiple architects and builders in attendance from Urban Architects and PC Construction as well as Superintendent Scott Greenland. The design of the 661-square-foot entrance lobby is bright and open, wrapped in a glass storefront and glazed curtain wall systems to allow natural light into the area, with textured porcelain ceramic tile making up the lobby floors and gypsum board for the ceiling, according to Nandini Sengupta, LEED AP, senior associate at Urbahn Architects. In addition, the lobby will feature cabinets for the display of 3-D–printed artifacts as well as a textured wall art invoking 3-D–printed panels, with splashes of the school’s navy blue and orange colors. To read the entire article, check out the March/April issue of School Construction News.